Which Logical Scale is right for my small business? 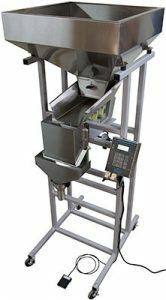 Logical Machines has the right Semi-Automatice Scale System for your packaging needs. Whether you're filling half an ounce or 75 pounds, free flowing materials or something more challenging, we can find the scale system that will fit into your workflow and save you time and money. 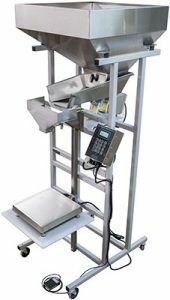 Logical Machines come in 4 flavors: the S-4 Semi-Automatic Scale System, the S-5 Bulk Scale System, the S-6 Cascading Scale System, and the S-7 Dual-Lane Scale System. Please refer to the table below to learn which Logical Machine would be best for you and your packaging needs. * "fills/hour" refers to the actual number of packages that a real person can expect to fill in an hour on a sustained basis. • ground coffee, seeds, coffee beans,beads, soap powder, dry bulk chemicals,etc. • 0.5 oz to 10 lbs range • bulk nuts, pet foods, seeds, grains,food addiments, etc. • 10 lbs to 75 lbs range • crackers, chips, dog treats, etc. • 0.5oz to 10lbs range • bulk nuts, pet foods, seeds, grains, powders, food addiments, etc.